If you like cherry desserts, you are going to fall in love with this moist and flavorful homemade Cherry Chocolate Chip Cake! Not only does this cherry cake taste amazing, but it is beautiful too! Maraschino cherry juice is stirred into the batter, lending a wonderful cherry flavor and lovely shade of pink. 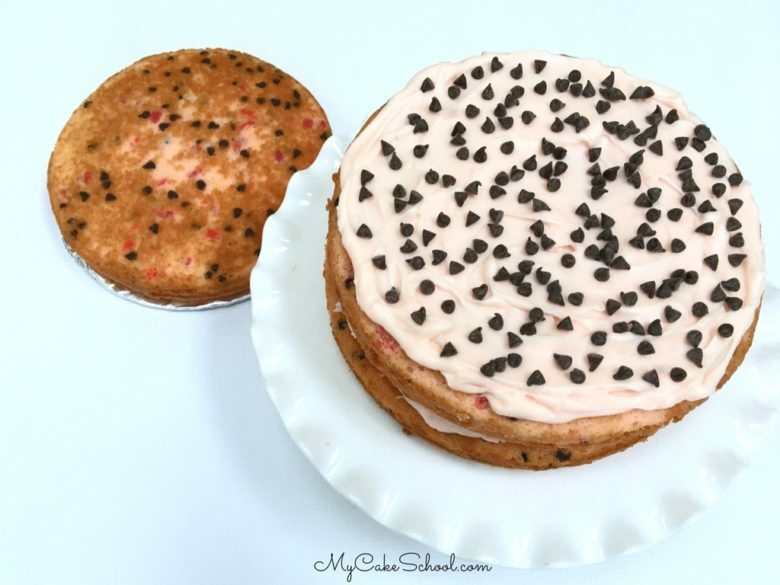 The addition of maraschino cherry pieces and mini chocolate chips gives a great texture and flavor boost to the cake as well. 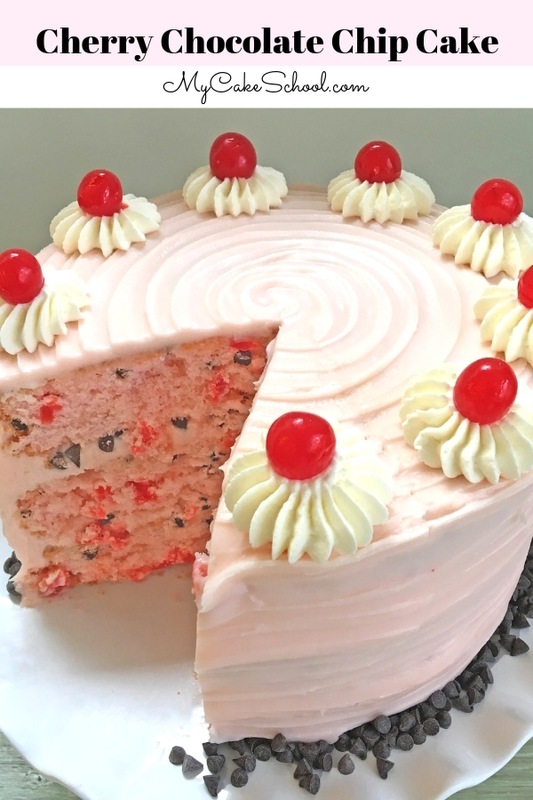 As much as I love our original scratch Cherry Cake Recipe, the addition of mini chocolate chips and Cherry Cream Cheese Frosting takes this cake to a new level. This Cherry Chocolate Chip Cake is very moist, but sturdy enough to hold the weight of fondant, and it works well as a cupcake recipe also. I love a versatile recipe! Mini chocolate chips add just the right amount of chocolate flavor without being overpowering. I prefer the look of mini chocolate chips to the regular size, but more importantly, these lightweight chips are less likely to sink to the bottom of the pan. As we mention in the recipe below, we divided the cake batter between three prepared 8 inch pans, and once filled, we sprinkled additional cherry pieces and mini chips on top of the batter and just barely tapped them in. Doing this step helps to ensure that the cherry pieces and mini chips will be evenly dispersed throughout the cake layer. 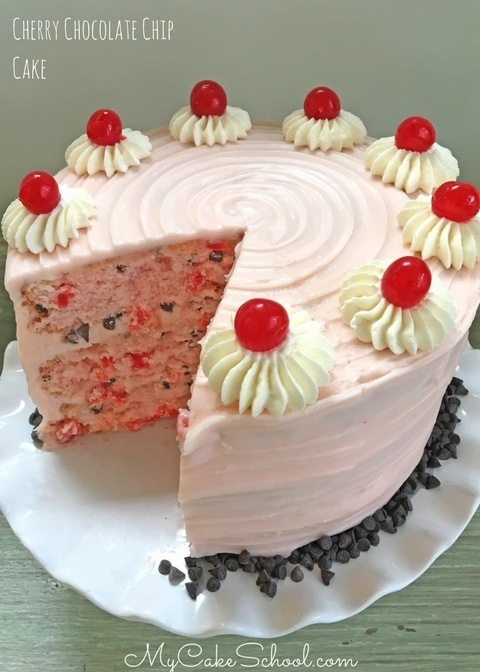 Once our Cherry Chocolate Chip Layers were baked, I assembled the layers with a cherry cream cheese filling topped with a sprinkling of mini chocolate chips. 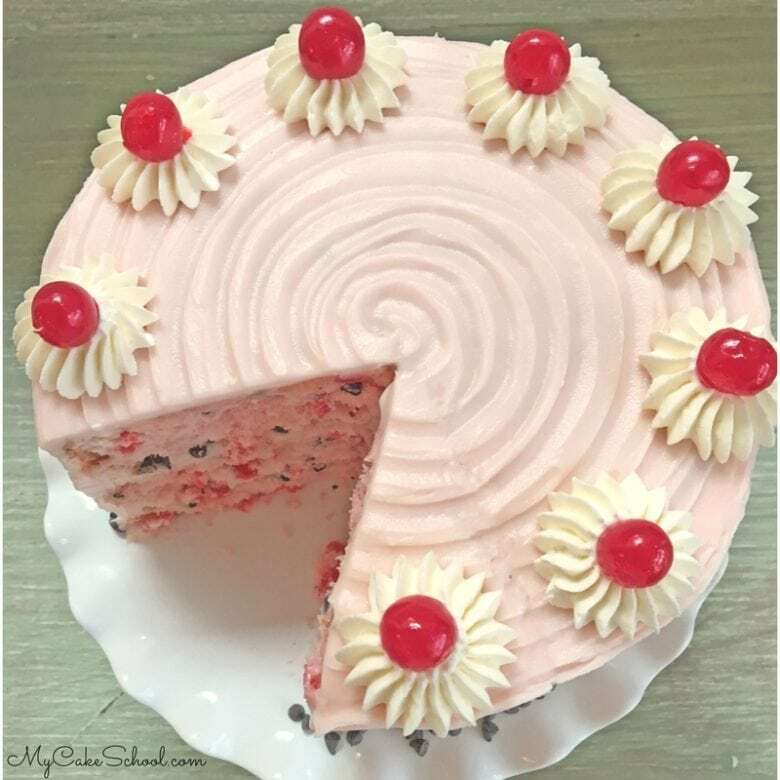 I frosted the cherry chocolate chip cake with a layer of our Cherry Cream Cheese Frosting, and then applied a small angled spatula to it to create a ridged effect as I rotated the cake on a turntable. You can work from the top edge of the cake to the bottom, or vice versa. This frosting technique is such a simple and easy one, I use it often! After texturing our buttercream, I finished off the cake with a border of mini chips, and used a french tip to pipe our whipped cream around the cake. The maraschino cherries add a great pop of color! We hope that you enjoy this cake recipe as much as we have! My husband and daughter have both declared that this will be their birthday cake, haha. Enjoy! Moist and Delicious Cherry Chocolate Chip Cake- this moist layer cake has so much flavor! Maraschino Cherries from 10 oz jar (use all) chopped and dusted with 2 Tablespoons flour. Bake for 30 - 35 minutes, when the cake springs back to the touch or a toothpick pulls out clean or with only a few crumbs attached, the cake is done. Chill the mixing bowl and beaters or whisk attachment in the freezer for 10 minutes. Pour the whipping cream, powdered sugar and vanilla into the chilled mixing bowl, begin beating on low speed gradually increasing to medium high speed. The cream begins to thicken (approx. 1 1/2 minutes) and soft peaks form….peaks that slightly bend over. Watch closely as this happens quickly. Do not over beat or it will turn into butter. Place first layer of cake onto your cake base (or cake board) of choice. Spread first layer with Cherry Cream Cheese Frosting, sprinkle with mini chocolate chips, and repeat. Frost the entire cake with Cherry Cream Cheese Frosting. I had just enough to frost our 8 inch cake. I then piped whipped cream with a french piping tip and added maraschino cherries. Sounds delish! I love the cherry cake so I will try it with the chocolate chips. Thanks ladies – always creative and delicious! Sounds amazing! How much cream cheese in the frosting? Hi Luanne, There are two eight ounces packages of cream cheese in the frosting. Let us know what you think if you give the recipe a try. This cake is beautiful and looks so delicious!! Thanks for sharing the recipe! I have been going through a lot of websites and here I stop.I am going to make this recipe next week for my birthday as I am obsessed with this cake.Thanks for sharing this.This cake simply looks AWESOME. Thank you so so much for this wonderful recipe. What brand cherry extract do you use? Is it imitation cherry extract? Hi Janet, we used Watkins imitation cherry extract. I bought it at Walmart. Can you use plain flour instead of cake flour? If so, will you use 3 cups? Hi Joy, If you do not have cake flour this is how you can make it. For each cup of flour used, remove 2 Tablespoons flour and replace with 2 Tablespoons cornstarch, whisk to blend. For this recipe you will measure out 3 cups all purpose (plain) flour and remove 6 Tablespoons, replace with 6 Tablespoons of cornstarch. Hope you enjoy the recipe. Thank you BeBe, Its seem every time I bake with cake flour the cake layers are very dense. I like more of the fluffy layers. 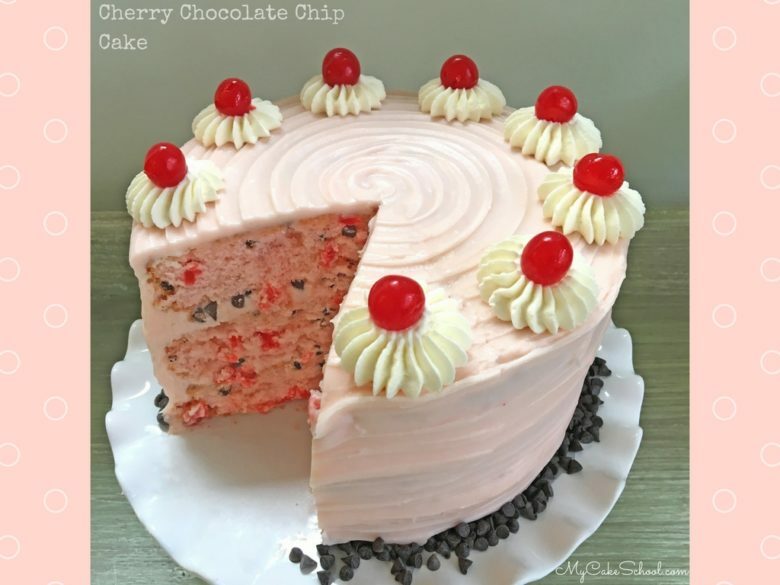 I was wondering…if I made this cake and left out the chocolate chips, would it be the same cake as the other cherry cake recipe? Thank you. Hi Paula, Yes, it would be the same and the other Cherry Cake recipe. I’m new to the website and notice that you always call for 8″ cake pans. Can you help me adapt this recipe for using 9″ pans? Hi Sandra, this recipe would work well for 9 inch pans also. The layers just will be slightly shorter. The bake time may be slightly shorter too….I would keep an eye on it during baking, the bake time could probably be reduced by about 5 minutes. Hope you enjoy the recipe! 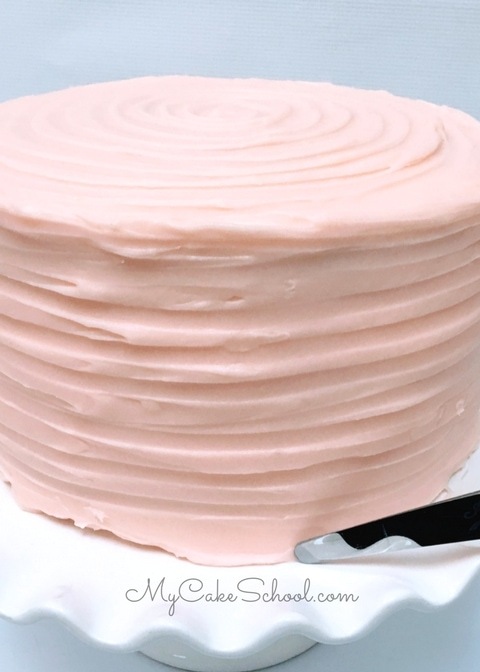 Is there a video of making the marks in the icing? I love this affect, just not sure how to get it! Tried this one for this weekend. Mine is no where near as pretty as yours but it turned out nicely and was very good! Thank you for the recipe! @Linda King- Thanks! I like to apply a coat of frosting and get it pretty smooth (with bench scraper or your spatula of choice)…then go back in with a small tapered icing spatula and touch it to the cake as you spin it on the turntable. You just move the position of the spatula gradually down with each rotation. I don’t believe we have any free tutorials on this, but if you are a member of our site you can find it under “ridged effect”. Hope this helps! @Heidi- I’m so glad that you made it and liked it, the cake looks great!! I want to make this cake for a friend’s birthday next week. So pretty! I want to include the whipped cream around the edges like the picture shows. I’m wondering if it will be okay left out of the refrigerator for a few hours though during the party? Will the whipped cream run or fall flat from the cherry on top of it if I do that? Thank you! Very excited to taste this cake! Hi Courtney, The cake has a cream cheese frosting so it will be refrigerated. I like to be on the conservative side so approximately 2 hours for the cream cheese and whipped cream. The whipped cream may begin to deflate a bit but I don’t think it will fall flat from the cherry on top. The cake itself being cold will help to keep the frosting cool as it gradually warms. The warmth of the room will be a factor also, hopefully it is air conditioned. All should go well. Thank you so much for your response! I think I will go ahead and use the whipped cream on top! I’m actually going to use my regular buttercream (flavored with the cherry extract) to frost it instead of the cream cheese frosting. I’m not quite sure how much cherry extract to add into the buttercream though…was just planning to wing it since I have never taste tested. Any suggestions? Vanilla extract PLUS the cherry? Just the cherry? Hi Courtney, I am a little more worried about the whipped cream if it is going to be on a room temperature buttercream cake. You could refrigerate your buttercream cake until time to travel to the party. Another possibility is to use buttercream instead of whipped cream for the french tip piped decoration. It will give you the same look without having to worry about the whipped cream sitting out too long. Just save out about 1/2 cup buttercream ( you won’t need much) then tint the remaining buttercream pink. Also, I think you will be fine using 1 teaspoon cherry extract and 1 teaspoon vanilla extract in your buttercream, give it a taste test to see what you think. Sometimes it is difficult to find cherry extract, we bought ours at a Walmart grocery. The brand name is Watkins, you can also find it online. That’s a great option for just using the white buttercream…can’t believe I didn’t think of that. Lol. Thank you so much for your help and advice! I appreciate you!